His real name was Donald Mackenzie Brownlee. During the First World War he served as naval cadet, then studied at the Geelong College and became an auditor. In 1924 his voice was discovered by Nellie Melba, when during the second Australian tour in Melbourne he sang the part of Baßsolo in ‘’Messiah’’. Then he continued his education in Paris under the famous baritone Dinh Gilly. 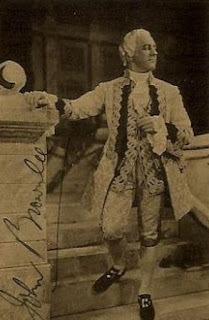 He made his second debut in 1926 at the Théâtre Trianon-Lyrique in Paris in ‘’Lakmé’’ of L. Delibes. The same year he appeared opposite Nellie Melba at the London Covent Garden. In the 1927-1936 seasons he worked at the Grand Opéra in Paris (debut: Athanaël in ‘’Thaïs’’ of J. Massenet). During this time he made guest appearances in London, Brussels (1939), Antwerp, Buenos Aires (1931) and in Rio de Janeiro. In 1929, as a member of Nellie Melba’s opera troupe, he sang again in Australia. At the Royal Opera House, Covent Garden he appeared between 1930 and 1949 as Mercutio in ’’Roméo et Juliette’’, Golo in ‘’Pelléas et Mélisande’’, Jago in ‘’Otello’’, Amonasro in ‘’Aida’’ and as Scarpia in ‘’Tosca’’. In 1935 he performed there in the English première of the opera ‘’Koanga’’ by Delius. In the 1949-1950 season he had at Covent Garden a huge success as Papageno in ‘’Zauberflöte’’. In 1930 he made guest appearances at the Opéra de Monte-Carlo as Athanaël, Rigoletto, Peter in ‘’Quo vadis?’’ bt Nouguès, Escamillo in ‘’Carmen’’, Valentin in ‘’Faust’’ and as Wolfram in ‘’Tannhäuser’’. From 1935 to 1939 seasons he appeared at the Glyndebourne festival as Don Giovanni, Alfonso in ‘’Così fan tutte’’, Speaker in ‘’Zauberflöte’’ and as Count in ‘’Figaros Hochzeit’’. In 1947 he again sang there in ‘’Figaros Hochzeit’’, in 1949 in ‘’Così fan tutte’’. In the 1948-1949 season he appeared at the Edinburgh festival. In the 1937-1957 seasons he was a member of the New York Metropolitan Opera. Here he made his debut as Rigoletto and sang in 1948 in the première of the opera ‘’Peter Grimes’’ of B. Britten.At the Metropolitan Opera his repertoire included Count in ‘’Figaros Hochzeit’’, Don Giovanni, Alfonso in ‘’Così fan tutte’’, Papageno, Kothner in ‘’ Meistersingern’’, Escamillo in ‘’Carmen’’, Marcello in ‘’La Bohème’’. In the 1937-1938 and 1945 seasons he was to be found at the Chicago Opera, in the 1940-1950 seasons almost annually at San Francisco Opera. In 1957 he retired from the stage and since 1960 he was a president of the Manhattan Institute of Music. From 1953 to 1967 he was a president of the American Guild of musical Artists. Later he became a respected vocal pedagogue (among other things teacher of Ezio Flagello and Johanna Meier). Marcello 3/9/1937, Il marito 3/3/1938, 3/8/1938, Lescaut 12/13/1938, Il marito 1/11/1939, Valentin 1/2/1940, Il conte d’Almaviva 12/3/1940, Sharpless 3/4/1941, Pan 1/20/1942, Golaud 3/21/1944, Marcello 1/16/1945, Dottor Malatesta 1/22/1946, La père 1/6/1948, Captain Balstrode 2/17/1948, Il conte d’Almaviva 1/18/1949, Marcello 12/20/1949, Herr von Faninal 1/9/1951, Dr. Falke 4/3/1951, Don Alfonso 1/27/1953, Fritz Kothner 2/14/1956, Sharpless 2/14/1957 (in Filadelfia).